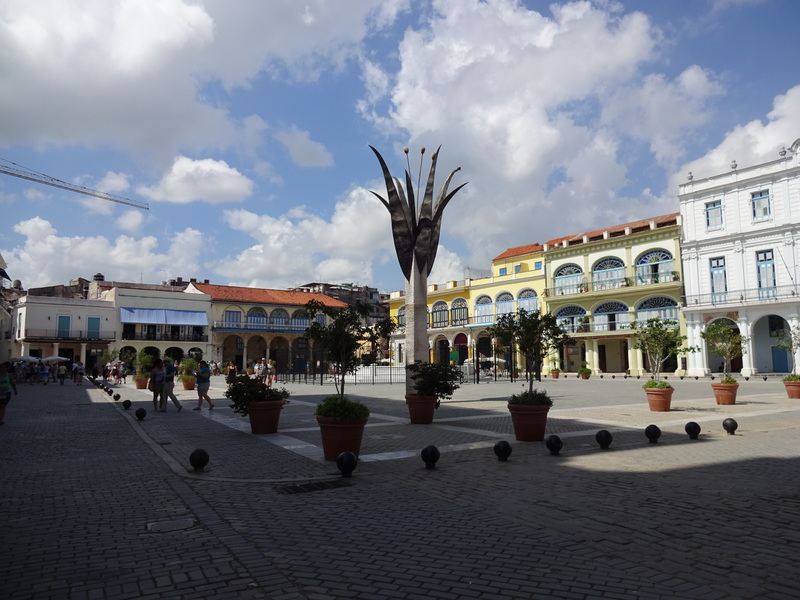 Varadero’s white sandy beaches and clear waters are entertaining, but we also went to Cuba to learn more about the music and dance culture, so we left the beach behind from time to time to explore nearby cultural enclaves. Let’s get ready to rumba! In the small town of Cardenas, we had our first introduction to rumba. The local rumba group was composed of one singer and several percussionists and dancers, and they began by giving us an informal performance. Many of the percussionists and dancers would alternate, letting someone take the stage to show off their dance moves. The main type of rumba they demonstrated was performed by a male/female pair. The man and woman danced alongside each other facing the audience (rather than each other). The woman carried a red piece of cloth that she waved and shook, somewhat like a torero taunting a bull. And from time to time, the man would make some sort of aggressive motion towards her, whether he was thrusting his hips or kicking his foot in her direction. We later learned that this is a typical type of rumba, where the woman coquettishly entices the male, but when he attempts to get up in her business, she has to deftly block him. They explained that this was the traditional rumba, but they also wanted us to see what the modern rumba looked like. A young boy (who was probably around 10 or 11) emerged from the percussion section and began his performance. It included a lot of jumping and writhing on the floor, and at one point, he brandished two small knives, and while he lay on the floor, he brought the knives toward his body and began to stab the ground around him in quick succession. I found this aspect of the performance a little disturbing—I’m not used to seeing children wield knives in that manner—so it would have been interesting to hear what his inspiration had been for his choreography. On another day, we headed to the town of Matanzas for a lesson in Afro-Cuban dance inspired by the Yoruba traditions. Our large group climbed up a few flights of stairs to a tiny, sweaty room, where we could barely all squeeze in. It was a little intimidating to walk into such a small space, but the instructor and musicians greeted us with wide smiles and class began almost immediately. They introduced us to several deities in the Yoruba tradition and explained how different types of movements are associated with different deities. Our teacher, a lanky 20-year-old man, switched easily between the male and female roles, simply donning a flowing white skirt when it was time to embody the more feminine deities and mimic the waves of the ocean with the fabric. After our class concluded, the group gave a performance, where our instructor and other dancers donned colorful costumes and took on the playful qualities of mischief-making deities. They stole people’s hats and water bottles, pulled us up from our seated positions and danced in circles around us, and eventually returned us to our seats and made sure everyone got their items back. It was a fun and playful scene and easy to just get swept up in the moment. 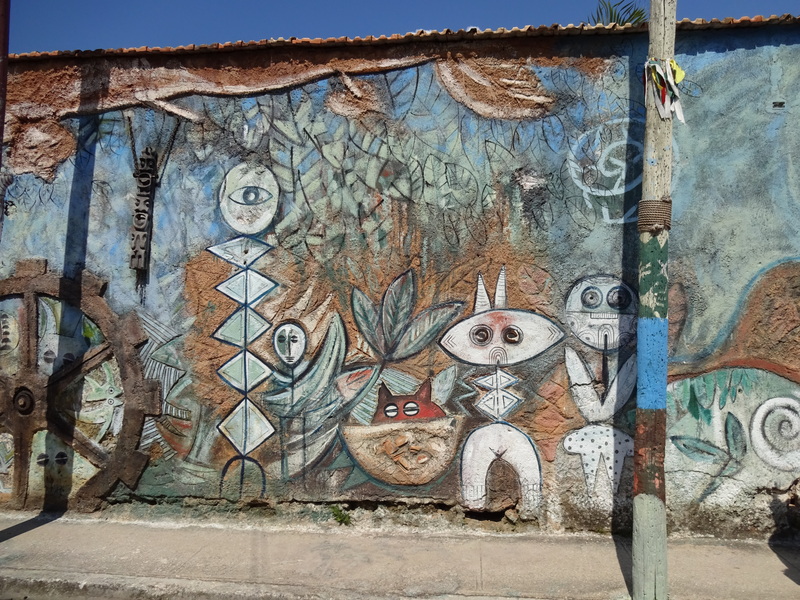 We then had a few minutes to wander around El Callejon de las Tradiciones, an “art alley” covered in murals made from recycled materials (pictured below). 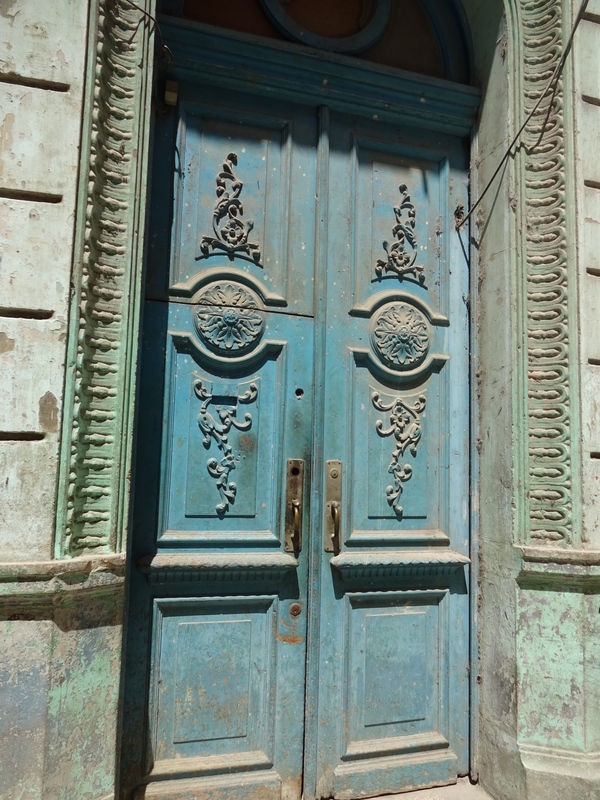 It only took a few hours in Havana for me to decide that I really liked this city. 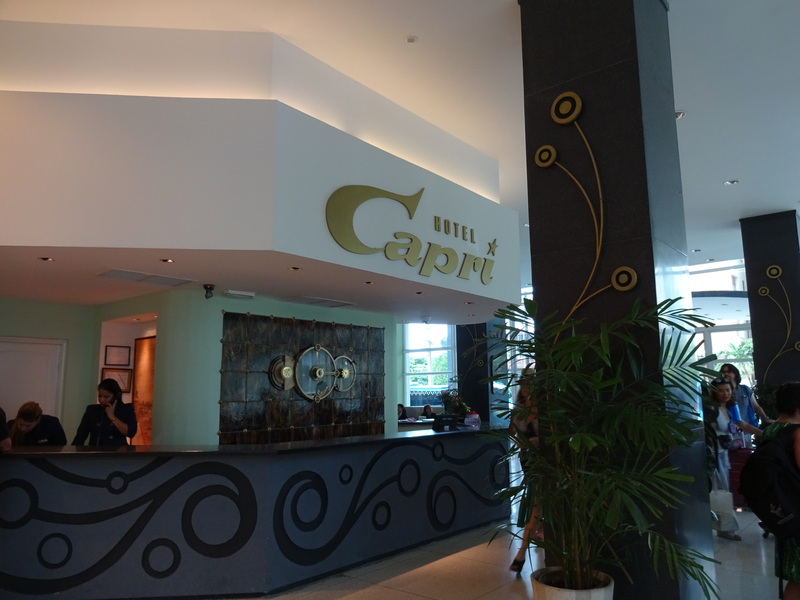 The mid-century modern aesthetic is in full effect, especially in our classy digs, the Hotel Capri. On our first night, we ventured to La Fábrica de Arte Cubano, also known as La FAC. This arts center offered a little bit of everything—photography, paintings, installations, live music… even reasonably priced mojitos! You could wander around several floors, each composed of smaller warrens and larger galleries. Some pieces seemed to reflect ambivalence about the impending influx of Americans and American influence, including a video installation of a man building an American flag out of bricks and tearing it down. Another installation featured a melting bicycle and a puddle filled with a video showcasing the leisurely pace of Havana life. It was hard to imagine that this wasn’t created with some trepidation about the future and how that slow pace will be forced to speed up to catch up with the rest of the world. Tucked away in one of the corners of La FAC was a tiny shop called “Clandestina.” It sold T-shirts, magnets, and posters bearing funny slogans such as “99% diseño cubano” (99% Cuban design) and “actually, I’m in Havana.” The friendly guy working there, Oscar, explained that they had a larger shop in Old Havana, so the next day we went to check it out. It turns out that they take a lot of recycled materials (including souvenir T-shirts from Cozumel!) and print over them with their own designs (hence the 99% Cuban design). 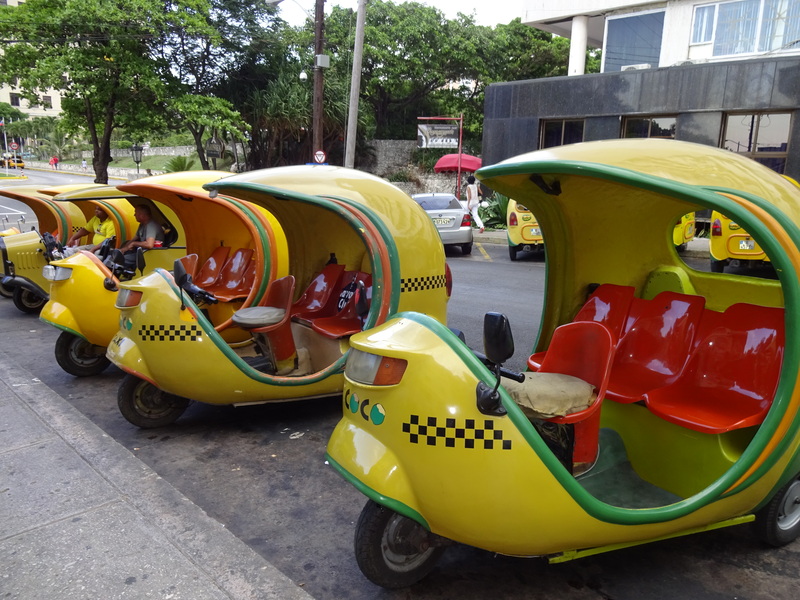 New cars may be scarce, but Havana is full of the adorable “coco taxi.” These scooters have been outfitted with round, shiny yellow shells and a couple of seats in the back. It’s basically the tuk-tuk, Cuban style, but for some reason this is so much more enjoyable! You just have to close your eyes and say a few prayers occasionally when you find yourself inches away from a bus or a behemoth classic American car. When we arrived at our hotel, there was a bright pink cadillac with a cowboy driver parked outside. 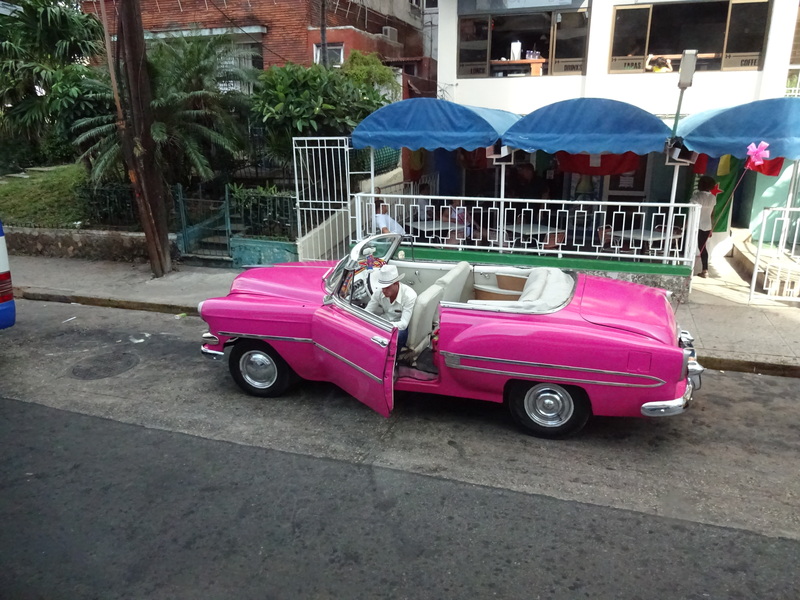 Does Havana have the world’s cutest taxis, or what? For 30 CUCs (roughly $30), we arranged for a tour of the city in a purple convertible with the genial Marín. 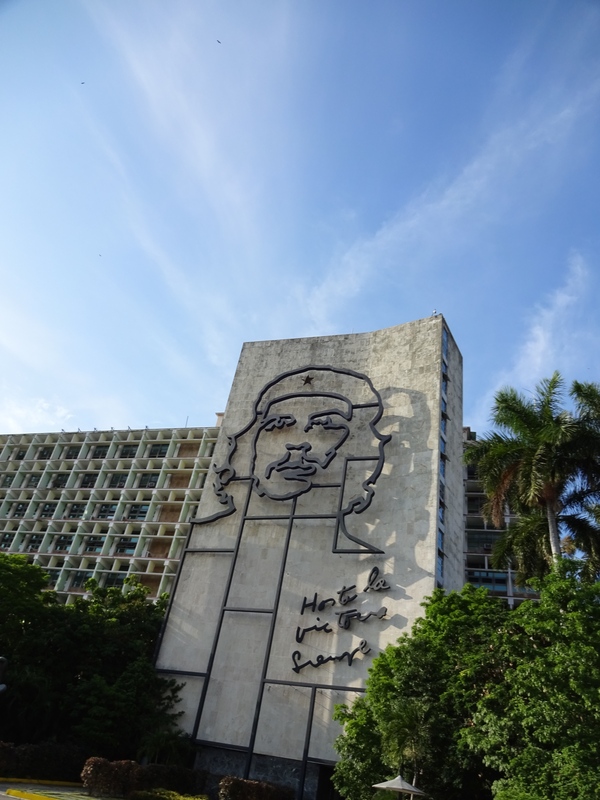 He took us to several scenic points, including the old fortresses, the statue of Christ, through Chinatown, and to La Plaza de la Revolución. 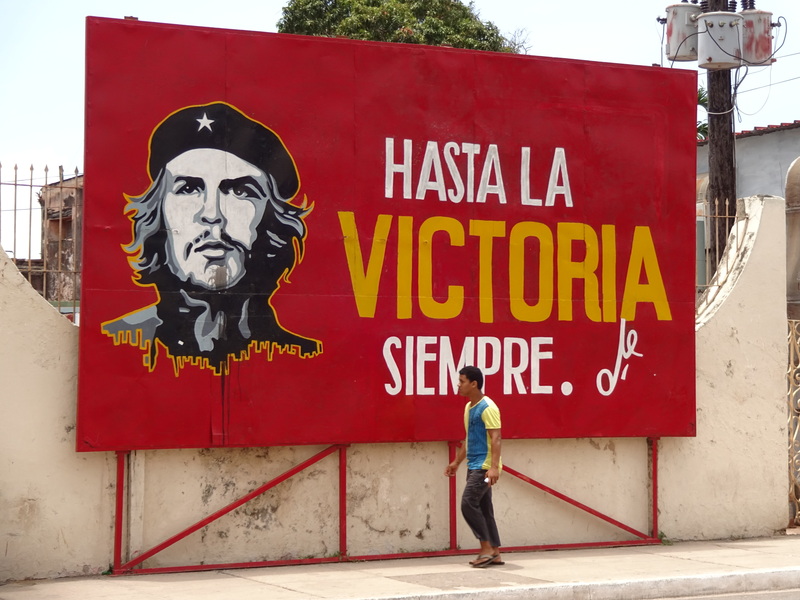 As in most places, Che Guevara was featured prominently. Our journey ended in the leafy Miramar neighborhood, where we went to see a performance at La Casa de la Música. But before the performance, we had time to grab a quick bite. Directly across the street from the club, we saw an adorable pâtisserie, full of decadent cakes and sweet treats. 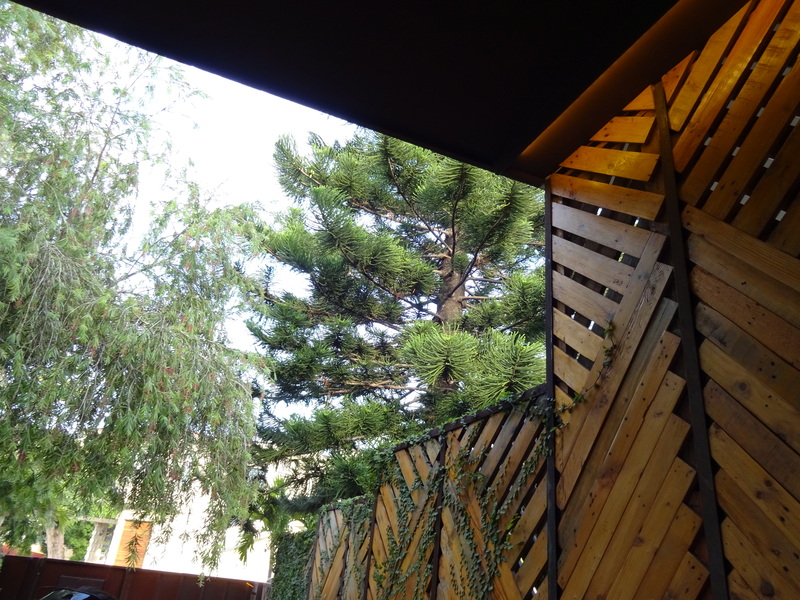 However, we were hoping for something a little more substantial, so we asked the staff, and they told us there was a paladar (a semi-private dining space) just around the corner. It turned out that Otramanera was a hidden gem (to us, anyway)! A guard stood in front of the thick metal gate, but when we asked if it was a paladar, he graciously opened the door to reveal a lush garden patio. We sat outside and enjoyed the evening, quenching our thirst with a mojito frappé (a blended mojito) and filling up with Italian-inspired cuisine. It was definitely my favorite meal during my time in Cuba, both for the setting and the food. There’s always an urge when you go somewhere to draw connections with other places you’ve been (or at least it’s an urge that I feel, anyway). But in many ways Havana defies comparison. 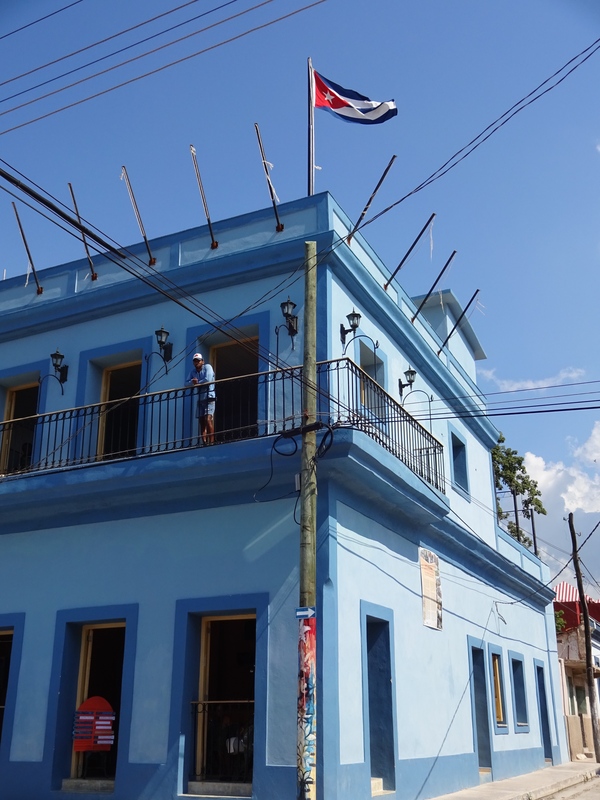 Having the world virtually at our fingertips sometimes means that we neglect the real world around us, and my brief time in Cuba reminded me of that. As relations with the US continue to “normalize,” it will be interesting to see how life in Cuba changes. I’m grateful that I had the opportunity to go when I did and catch a glimpse of Cuba at this unparalleled moment in time. Miss Part 1 of my mini-series on Cuba? Find it here.